I had to check again. I was not quite sure of the claim I am about to make: I have completed the outline for a low budget feature film, and I am happy with the result. When I woke up and read it one last time, a strange feeling of satisfaction invaded my mind; unusual. I often struggle with looking back at my own work. I do not like the word perfectionists, but I find it difficult to please myself. I believe those are simply the doubts that continuously shape our creative process. The trials and tribulations of shaping my stories led me to this point, a new beginning informed by restructured mental wanderings. It was important, with this attempt, to write within extreme limitations. I’d love to see this story eventually move into production. I need few locations, few characters and possibly some repetition, a layered reveal of information playing with limited point of views and understandings. For a never ageing kid, imagining a world made out of a couple sticks and 2-3 toys is fairly easy. To make it emotionally engaging and mentally stimulating for someone besides my inner child is not as easy as playing figurines. However, out of limitation comes creativity. Humanity has been shaped by the problems and limitations it has faced throughout its history, and my outline is no different. It was important to start with a feeling, something strong that drives us forward. In this case, a feeling of wonder; a kid and a closed door. This sensation that there is an unknown world out there, with something as simple and as daunting as a door handle between us and adventure. It might be because of the amount of times I have watched the original Star Wars, building cockpits stacking pillows, confident that the force was with me, but I trust my feelings. The first few mental images are generated from these feelings, and those images will eventually lead to written words. However, to move forward not only did I need to rely on my feelings, but I also had to understand the feelings and emotions of my characters. I like to discover characters more than I enjoy creating them. I might have a blurred initial imagine of who they might be, but I find that the best way for me to discover them is by writing a couple of scenes. I like to give my character an objective and throw her/him into a scene to see how she or he would react. Recently, after reading a short ‘discovery’ scene I had written the night before, I found myself exclaiming out loud: “What a prick!”. I instantly knew I should commit to the few beats that created the sensation and prompted me to judge my character in such a strong way. The three emotions I mainly rely upon are sympathy, empathy and antipathy. They guide me, and help me commit to specific character’s details, building depth and backstories. I need to know important details before I can look at the big pictures, and eventually start to become obsessed with plot and structure. There are countless writings gurus out there that have addressed scriptwriting from a structural point of view. You can find various beat sheets designed to make you map your plot, 3-acts, 5-acts, 9-acts, 120 beats… many promises of perfect timing and successful scripts. Did I use them? Of course! Which one? A bunch of them. From Syd Field, to Blake Snyder, to Todd Click, various gurus have helped me. I like to flip through the pages and look at the beats or plot point and try to map my story onto their proposed structure. I type them down, contemplate them. They reshape my story, the motivations. Every now and then I have a “Ha-Ha” moment, a strong feeling that somethings feels right, that it removes the clunky inelegant elements of the story simplifying and strengthening the plot. I commit those ‘Eureka” moments in bold onto the page. Finally, eventually, after a few late night wondering sessions, after reshaping and refining the world, characters and plot, all the pages turned bold. Is it, really? Yes, it feels right, and it leads to the right place. In the end, there is only one plot: ‘things are not what they seem’ everything else is just emotions. 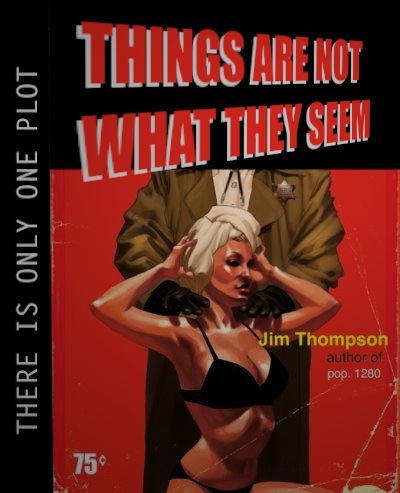 You can ask Jim Thompson. It is time to leave behind the feeling of accomplishment and dive into the real first draft. Eventually, hopefully, time will come to stop drawing blueprints and finally commit to something. I look forward to the editing suite. Judge, Judgement and Jury of one, not necessarily in that order. I do thank you for a well defined venture into producing, directing, casting and filmmaking but wait there’s more! When you read between the lines, I feel just as I blurred image think you were feeling that this is quite enough exposure for something so emotional as emotions. Never the less I enjoyed your processing and the thinly vailed future steps clue to wash, rinse, repeat during editing.